The Biblical Sabbath Is Saturday. Then, Why Do Most Churches Worship on Sunday? It is clear that the Biblical Sabbath is Saturday, the seventh day of the week. The early Church kept the Sabbath day holy according to the teachings of the Bible (Ac 17:2; 18:4). Then, why do most churches today worship on Sunday? Let's find out the reason. 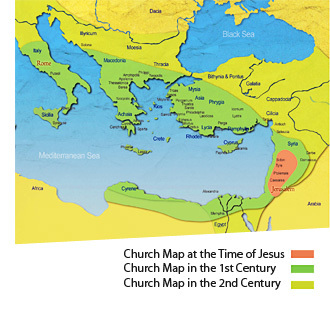 The early Christian Church, which started in Jerusalem, prospered and spread to Asia Minor near Israel, to Macedonia and even to Rome. In this process, there was something inevitable—that was a conflict with the Roman religion. The Roman imperial family abhorred the Jews who believed in Judaism. The Romans believed in many different gods, and from their polytheistic view of religion, it was hard to understand the Jews who believed in the one and only God—Jehovah, and the Jews were reluctant to follow the Roman orders using their religion as an excuse. To the Romans, Christianity seemed to be a sect of Judaism because it was also a monotheistic religion; Christians believed in Jesus as the Savior, and kept the seventh day as the Sabbath just as the Jews did. So, the people of the Church in Rome were unable to avoid persecution from the Romans, and they made efforts to inform them of the difference between Christianity and Judaism. In this process, they came to accept Sunday, which the Romans observed, as the day of worship. Sunday was the day set aside for the worship of Mithra, the sun god. Mithraism, an offshoot of the Persian religion Zoroastrianism, was introduced to Rome around the 1st century B.C. Mithra was described as the"invincible god" or the"god of immortal youth," and Mithraism had a following mostly among the soldiers of Rome. Around the time when Christianity spread in Rome, Mithra the sun god had already been raised to the status of the patron deity of the emperors and the empire, and Mithraism had been recognized as the most predominant and influential religion in Rome. The Church of Rome tried to escape persecution from the Romans by accepting Sunday, which was kept in honor of Mithra, as the day of worship. Around the 2nd century, the Church of Rome and some churches under its influence adopted Sunday as their day of worship, but the Eastern churches centered in Jerusalem kept Saturday—the seventh day—as the Sabbath according to the teachings of the Bible. However, as Constantine issued the Edict of Milan in 313 A.D. which declared the equality of all religions, it became a major turning point for Christianity. After Constantine issued the Edict of Milan, he initiated pro-Christian policies, giving privileges to the clergy and supporting the Church financially. However, it did not mean that he was fully converted to Christianity. He identified his favorite god, Mithras, with Christ, and retained the pagan high priest title"Pontifex Maximus" until his death. Ultimately, he chose Christianity for political purposes to unify the whole empire. To take forward these ideas, Constantine later issued a law requiring complete, public rest from work on Sunday. This is how the sun worship day was changed into the Christian day of worship. Constantine's Sunday Law, issued in 321 A.D., resulted in solidifying the position of the Church of Rome. Since Constantine forced all people under the control of the Roman Empire to rest on Sunday by his authority, even the Eastern churches which had continued to observe the Sabbath had no choice but to follow the Church of Rome. Of course, those who desired to preserve the truth adhered to the Sabbath, hiding in deserts and mountains, but it was impossible to prevent Sunday worship from spreading into all churches. 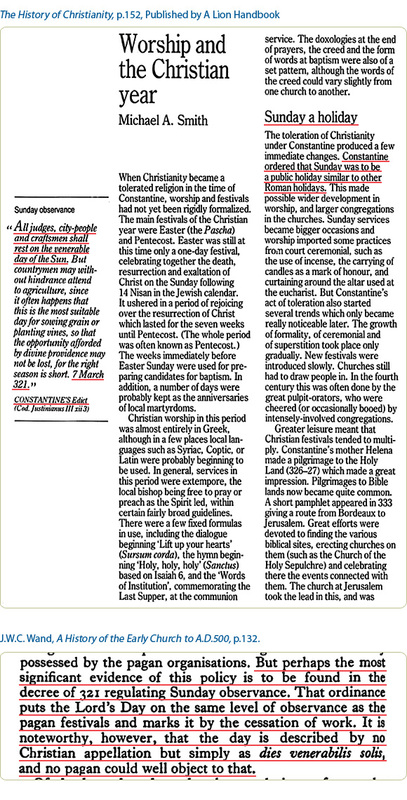 This is the origin of Sunday observance, and it has continued to this very day. However, even though many churches keep Sunday, God's true day of worship cannot be changed to Sunday—the day to worship the sun. God's commandments must not be changed by man for any reason. God came to this earth according to the prophecies of the Bible, and revealed the truth hidden in darkness to the whole world and let us know the true day of worship we should observe. The Sabbath that the Church of God keeps holy on Saturday, the seventh day, is the pure truth of the early Church which Christ restored at His second coming.